Now we’re getting into World Cup of CONCACAF territory. The final round of group matches saw three teams from the region advance to the knockout stage of the tournament: that’s never happened before. The final word on whether this is CONCACAF’s best-ever achievement at this tournament will have to wait just a while longer. We don’t yet know whether any of the teams will make it past the next round, nor whether their opponents should be regarded as great or simply fortunate. But the confederation has never had so many representatives in the last 16 of the World Cup, and that’s got to be worth something. For now, it’s worth a pat on the back and a brief acknowledgement of the achievement of something unprecedented. As it turned out, only two guys got rested: Michael Umana and Christian Bolanos. The match suggested, at least against a side as out of sorts in front of goal as England, that Costa Rica will be OK if one of their first choice defenders goes down: Roy Miller is an experienced member of this squad and not the defensive liability his past misfortunes for the New York Red Bulls might suggest. 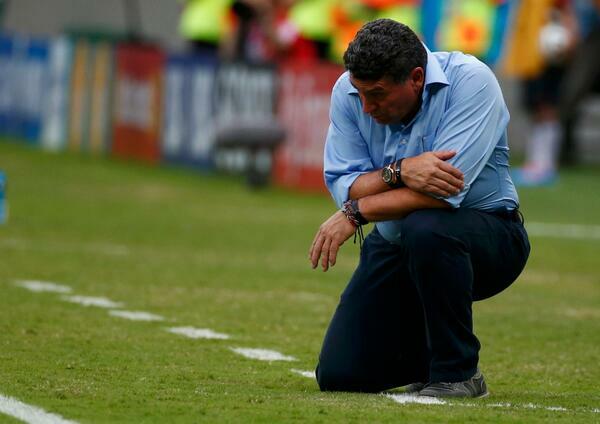 On the other hand, absent Bolanos, Los Ticos definitely lose something going forward. Randall Brenes is…a soccer player. He’s no Bolanos. Still, the team gave as good as it got from England, and the tie was all that was needed to win the group. This is the first time in Costa Rica’s brief World Cup history (2014 is its fourth trip to the biggest tournament) that it has won a group. 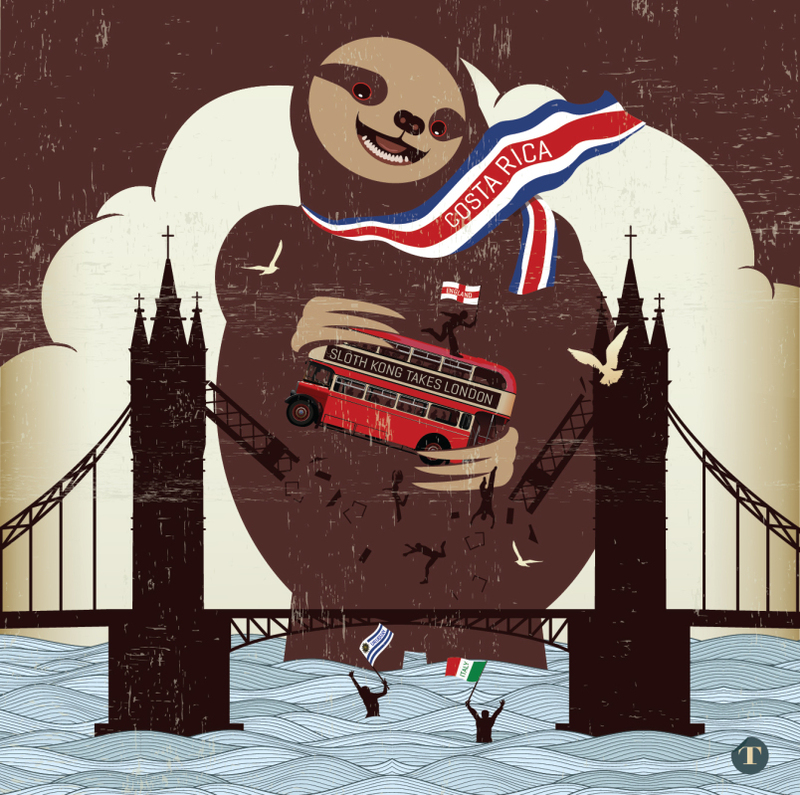 And the achievement is all the greater because it was a group of champions: England, Italy and Uruguay – all former winners of the competition, none able to best Los Ticos. The prize is not getting to play Colombia unless they make the final. Instead, Costa Rica will face Greece in the second round. It is an intriguing match-up. Fashionable as it is to pour scorn on teams that “don’t play the beautiful game”, as long as you play by the rules, you’re playing the game. And the beauty of the sport is the sheer variety of ways in which a game can be won. Not every generation has the ability to play tiki-taka or totaalvoetbal, not every team wants to: there’s no point in aping the tactics of a side that is better than you just so they can hammer you and validate the predictions of a few TV analysts. Pinto decided a while back that he’d build his team around a solid defensive platform, and the squad appears to have peaked at the very best time available. The Greeks made a similar decision way back when, and rode a limited player pool and a rigid tactical plan to the 2004 European Championship. They haven’t entirely abandoned the habit since, though it has never quite been as successfully executed as it was 10 years ago. 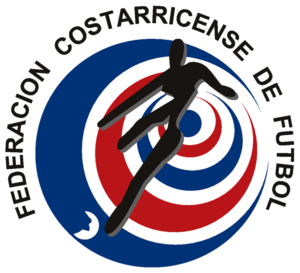 Costa Rica vs Greece will be painted as a clash of confederations, maybe even billed as Los Ticos fourth consecutive tilt at former champion of something significant. And it may be noted that there is a similarity in their respective approaches to the game. On paper, this suggests they’ll cancel each other out and one will prevail in the shootout after extra time. But the early part of this tournament has largely been an exuberant defiance of predictions, with Costa Rica leading the way. So one team will probably win by the odd goal in seven. Los Catrachos kicked off this match needing to win by two goals and hoping France beat Ecuador by three. Neither happened. The Swiss also needed a win and some help to progress, and they got both. Switzerland heads into the next round, on the back of a Xherdan Shaqiri hat trick. As for Honduras…let us be compassionate. This was the first time Los Catrachos had come to the World Cup and lost every game they played. They conceded more goals (eight) than they’d managed on their two previous appearances at the tournament combined (six). They need some time to reflect. Of the starting lineup in this final match in Brazil, Noel Valladares (37 years old; 125 caps), Victor Bernardez (32; 81), Maynor Figueroa (31; 108), and Carlo Costly (31;73) probably won’t feature in the next qualifying campaign. And the rest of the starters will all be in their early thirties by the time Russia 2018 comes around. 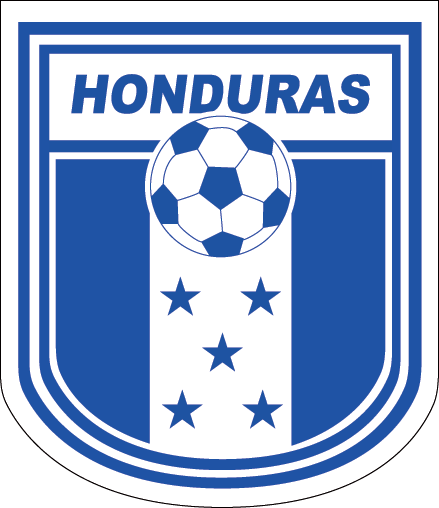 There is a rebuilding period ahead for Honduran football, and this was a sorry send-off for a talented generation of players. El Tri was heading into a nervy last 20 minutes, score still 0-0, Croatia cannily mixing rough with smooth to stay in the game. The Mexicans have the players to play rough-and-tumble football, but Rafa Marquez had already been booked, and there’s never any great reason to believe he’ll hang around for 90 minutes when the tackles are flying. Rafa’s 35, this is his last World Cup (for real, this time) – unless he pops up as a manager in the next one (not out of the question given the turnover associated with the head coaching job for El Tri). If he’d been sent off, it might well have been the last we saw of him in a Mexico shirt. He chose to defer the end of his international career. El Kaiser got on the end of a corner to put El Tri up a goal in the 72nd minute. It sparked a ten minute Mexican rage at Croatia. 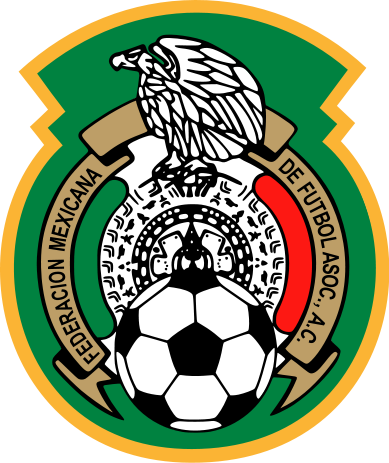 By the time it subsided, Mexico had three goals courtesy of the old favorites: Rafa first, Andres Guardado (assisted by Oribe Peralta and Javier Hernandez) second, and Chicharito (assisted by Rafa) third. 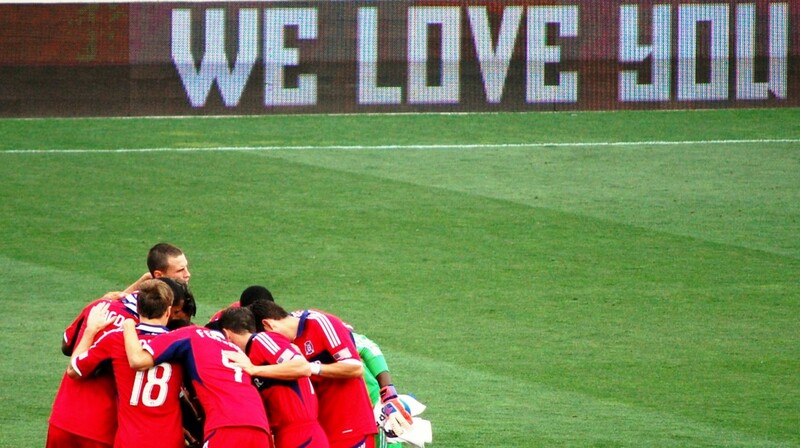 The Croatians’ goal was nothing but consolation. 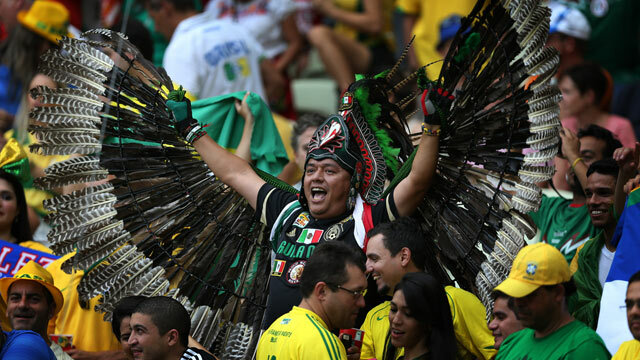 The Mexican national team is a hard sell to an American soccer fandom weaned on the pantomime of El Tri‘s villainy. 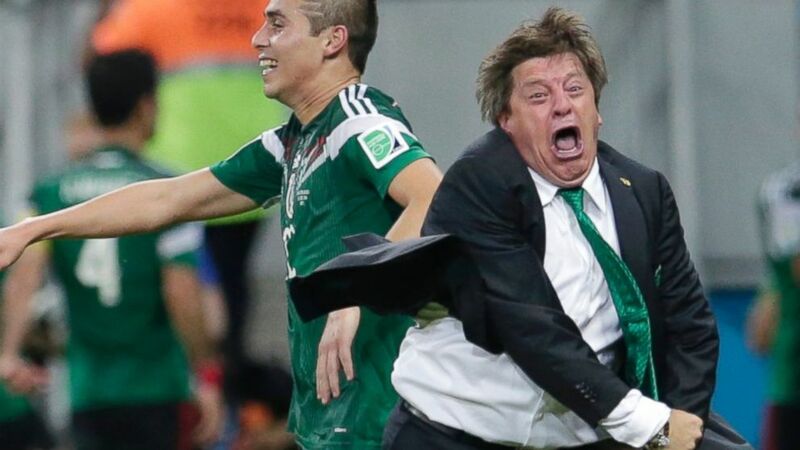 But Miguel Herrera is one of the most wonderful things that can happen to a football match, and one of the worst that can happen to a well-made suit. We want more Herrera in this tournament. Unfortunately, Mexico’s second round opponent, the flying Dutch, will be a tougher proposition even than Brazil, since the home team seems to a little slow to warm up, first place finish in Group A notwithstanding. Win or lose, Herrera’s exertions on the sidelines will keep his tailors well compensated. The rest of us can only continue to profit from him if El Tri stays in the tournament, so let’s hope Mexico channels Los Ticos and springs another victory for a CONCACAF David over one of UEFA’s Goliaths. The Germans feasted on possession and the American counter-attack was every bit as threatening as a zero-shots-on-target stat would suggest. Once Germany scored, in the 55th minute, it always seemed USMNT was relying more on neither Portugal nor Ghana being able to secure the result required to grab second place in the group. And that is exactly how it played out: the Yanks defended stolidly to limit the apparently inevitable loss to Germany to the narrowest result possible; Ghana needed two goals in the last 35 minutes of its game against Portugal to take advantage of USMNT’s problems, but managed just one – and carelessly allowed Cristiano Ronaldo to score his team’s second in the 80th minute. 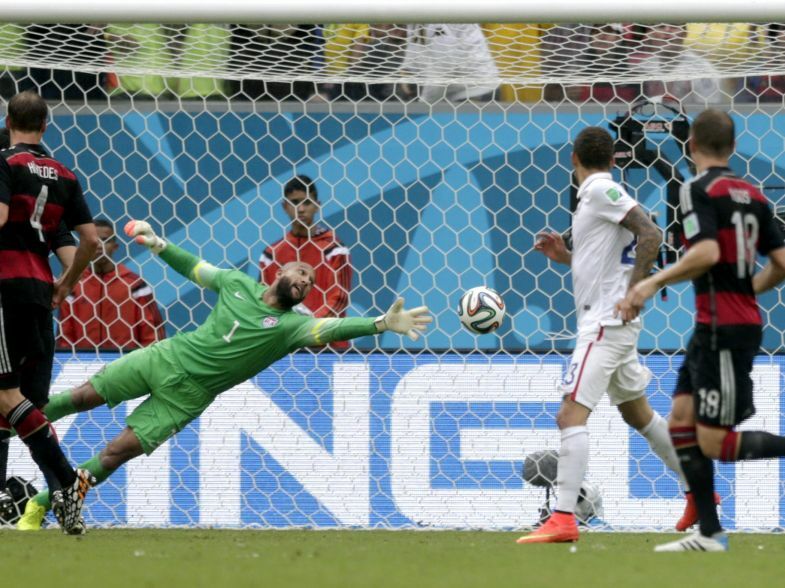 A 2-1 victory for Portugal over Ghana won qualification for USMNT. But it doesn’t really matter how a team qualifies, the point is to get through to the next round and hope for a better day. The Stars and Stripes are progressing because they accumulated a better record over three games than two of the other four teams in their group. They lost a game, just like every side not named Germany lost a game in Group G.
Now is not the time to lament not being as good as the Germans; now is the time to plan for being better than Belgium. Austin Fido is OTF’s CONCACAF and USMNT editor. Find him @canetop. ← USMNT Roundtable: So Far, So Good?